To make a living many poor residents from the country flock to China’s cities selling fruits, produce and prepared foods. Most sell their products without a permit and they often clog the sidewalks and main thoroughfares. 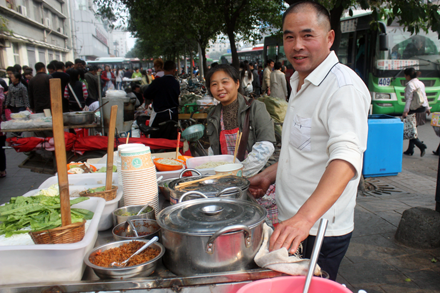 Over the last few years local city governments have been cracking down on these vendors to clean up the streetscapes under orders from the central government. The responsibility for enforcement falls to a local administrative unit called the chengguan (城管). The chengguan officers’ primary duty is to manage public facilities. They keep order in the parks, direct the flow of pedestrians and bicycles on the streets, and also ensure that street vendors are properly licensed and located within approved zones. Unlike the police their official enforcement power extends only to imposing fines and administrative penalties. A fruit vendor’s truck was pushed into a ditch by chengguan officers. But to read posts in the Chinese blogosphere and news media, these officers often use brute force and intimidation in handling the vendors. There are many reports of vendors being crippled or even killed as a result of beating. Vendors’ carts and trucks are routinely overturned and damaged. There’s been a significant backlash from these incidents recently, and local governments are making attempts to calm the furor. Chengdu for example recently came up with a novel idea to soften the image of chengguan by hiring women officers. Will this measure improve the situation for the vendors? I seriously doubt it. There is too much distrust between vendors and chengguan as it is. Until rules of law are transparently enforced the vendors are going to continue to play a cat and mouse game with the officers. Chengguan officers themselves are often corrupt and connected to local mobs, making them unlikely to change their tactics. 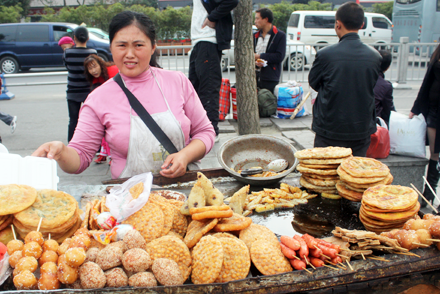 For now though you can find an incredible array of snack foods available from these street vendors. 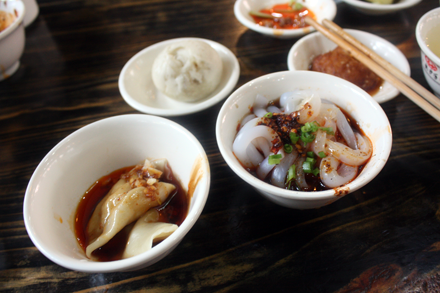 There are noodles, wontons, fried stinky tofu, scallion pancakes, and all manners of steamed dumplings. 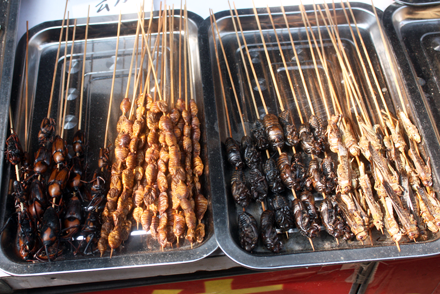 You can even buy insects and worms if you need special medicinal remedies. 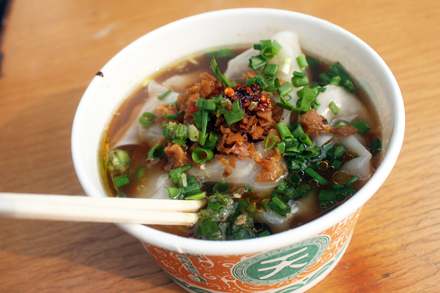 Of all Chengdu’s street foods the best-known and most beloved item has to be Dan Dan Noodles (擔擔麵). Originally vendors walked through the city’s neighborhoods feeding hungry local residents from baskets hanging from a pole balanced on their shoulders. In one basket they carried a stove with pot of hot water to cook the noodles while in the other basket were the sauces and toppings. The name “Dan Dan” comes from the Chinese nickname for the pole and baskets used by these vendors. Dan Dan Noodles are placed in a bowl lined with a spicy sesame sauce and then topped with Sichuan preserved greens. The noodles are mixed together with the sauce and the topping before being eaten. 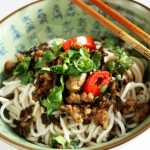 These spicy noodles, with their very complex flavors, epitomize the signature characteristics of Sichuan cooking. 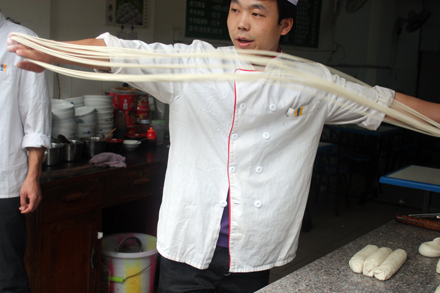 You may not be able to enjoy the authenticity of eating noodles from your local noodle man carrying his stove around your neighborhood, but if you follow my recipe below you will be able to sample one of the most delicious noodles of China. 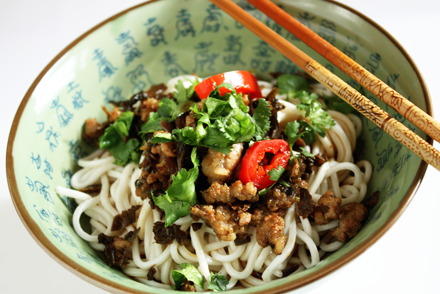 You will need to obtain a few authentic Sichuan ingredients in order to recreate this noodles dish properly. Sichuan peppercorns, either whole or powdered, are essential for the spicy flavor. If you get the whole peppercorns then toast them slightly in a dry wok or frying pan before grinding them in a spice grinder. Ya cai or Sichuan preserved greens is also an important component of this dish but they can be replaced with Sichuan pickled mustard stems, which are more readily available in Chinatown markets. Mix all the ingredients for the sesame sauce and set aside. Mix all the ingredients for the chili oil and set aside. In a wok heat the vegetable oil until just beginning to smoke then add the ground pork. Stir-fry the pork until just cooked then add the rest of the topping ingredients and continue to stir-fry until the liquid completely evaporate. Set the topping aside. 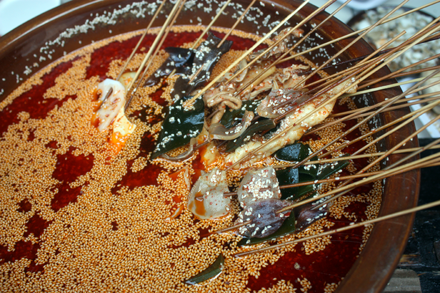 Divide the sauce by putting one quarter of the sesame sauce mixture and chili oil into each of four bowls. Add one tablespoon of soy sauce and one teaspoon of Chinkiang black vinegar to each bowl. In a large 8-quart stockpot bring four quarts of water to boil. Cook the noodles in the boiling water for about three minutes or until the noodles are just al dente. 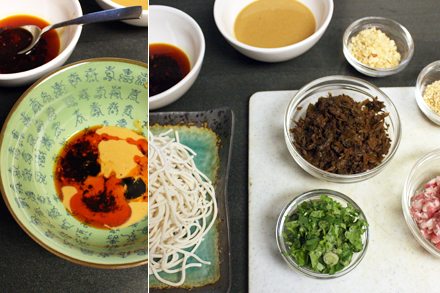 Divide the noodles into four portions and put them in each of the bowls. Top the noodles with one quarter of the pork and Sichuan preserved greens topping, and garnish with chopped cilantro and scallion. Serve immediately. Sorry to hear you had bad luck on the weather. I have been living in Chengdu the past 4 months, and I would guess about half of the days were quite sunny. Besides, I can still breathe quite well. The image of Chengdu as a foggy, extremely poluted city is strongly exaggerated if you ask me. I have seen defenders of the law having discussions with street vendors, but I never had the ‘luck’ of witnessing any agressive handling, not by chengguan guys directed at street vendors, nor by angry mobs directed at the chengguan guys. The issue must not be that big. By comparison: I did witness countless traffic accidents in the last four months. But I guess car collisions are not as hot on the net as aggressive chengguans. I have read about the handful of female officers, but I have yet to encounter one of them. I guess this is yet another piece of image building of the category ‘all it gets from the west is being laughed at’. 50% good sunny days is not a very good record is it? I must have been very lucky. four out of the five days I was in Chengdu I had relatively sunny days. Although even on a sunny day there is a hazy quality to it. Pollution problem is endemic in major cities of China and not just Chengdu. 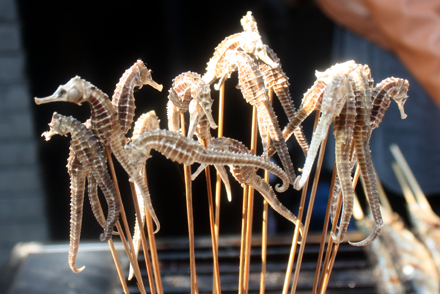 It is an issue that China should be serious about and not just use temporary measure to impress visitors. Shanghai banned production from dirty factories and limit vehicular traffic during the Expo this last summer. Simply to reduce the pollution so they can show the world that Shanghai is clean. I was completely surprised to actually see bright blue sky when I was in Shanghai during early November just after the Expo. Compare to the never ending haze I experienced during 2008 when I spent a year working there it was heaven. But the haze has now returned according to my Chinese friend in Shanghai. The problem with chengguan is not a “Western media” image problem. It is a much bigger issue of rule of law. Without transparency in administering justice, the people are not going to respect the law. Admittedly street vendors are illegal if they do not have a permit. At the same time chengguan officers are not functioning according to proper rules of conduct either. The culture of not obeying the law is a result of the law not being dispensed in a fair manner. The authority can bend the law anyway they wish for their own benefit. Even the central government routinely uses national security excuses to persecute opponents and punish businessmen that fell out of favors. Furthermore most people are so used to manipulating the system with bribes and personal favors that they don’t have any respect for the law. The chengguan officers are just a small way the populous can vent their grievances at. I thank you for your comments and I believe it is important to discuss these issues openly and objectively. 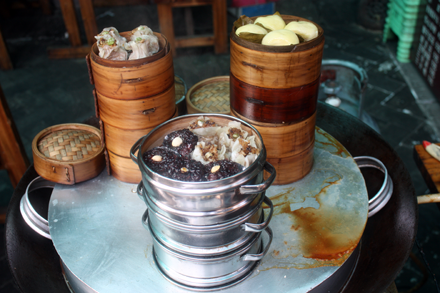 As an American that loves learning about real Chinese cuisine, I love this site and this post, but since this post is not completely about food, I’ll have to add that I’m happy to hear an objective voice in this discussion! There are two problems here: 1)westerners not knowing or bothering to learn much about what goes on in China and 2)some defensive Chinese citizens who often go to great lengths to defend everything about China, especially when its under the western gaze (such as an English language blog). “National face-saving” is understandable–I’ve done it while traveling. But it isn’t productve or honest. I myself spent a year living in Chengdu, and you can bet that we celebrated everytime the sun made an appearance. True, it is a humid river basin, surrounded by mountain ranges which tends to hold the humidity. This is the reason I would hear locals give to foreigners like myself. But of course, there is clearly a smog and pollution problem, a car culture growing at the speed of light, and the air so often smells like chemicals and smoke, like many big polluted cities around the world. Locals that I got to know will all too quickly go on and on about it. As far as the chengguan stuff…EVERY ONE knows about them! A public survey taken while I was living there cited “corrupt officials” as the #1 gripe of the Chinese. There is no secret that “rule of law” has a long way to go there, in politics and in commerce (I almost stopped eating huo guo after learning about the di gou you “sewer oil” practices). I’ve learned that every country has all of these problems to some degree, and we all have a state-run or private media to tell us we’re #1. But trying to counteract hundreds of years of western racism by whitewashing China’s (or any country’s) many ugly problems in the eyes of foreigners (or one’s own eyes) is a pointless battle. Besides, there are so many beautiful, impressive things about that country and its culture, if anyone is “laughing at China” they don’t know what they are missing. 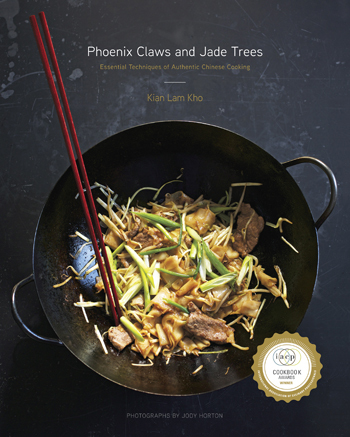 Kian, if we are unable to get fresh noodles, do you have any suggestions? Margaret, You can always use dried noodles. 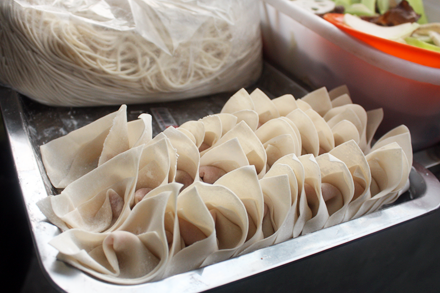 Select the kind that’s plain flour noodles without eggs. Look for the thickness similar to spaghetti, and not udon or angel hair sizes. Cook them to just about al dente. Don’t overcook. Enjoy! thank you for the dan dan mian recipe, though. 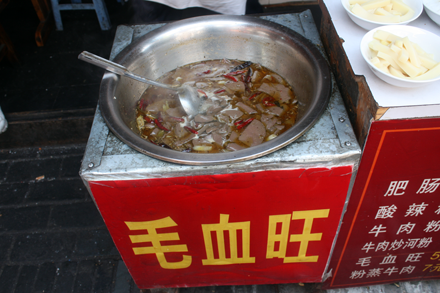 i’m from shanghai but i must admit, i like sichuanese food the best. 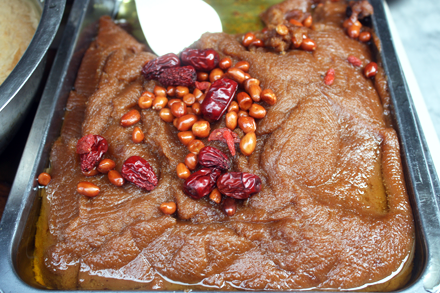 This is a wonderful post about Sichuan food. It really reminds me of the kind of food I grew up with. 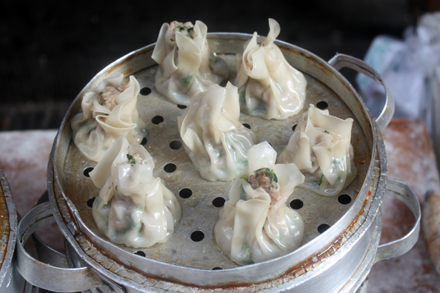 I miss all the street eats and the Sichuan food here in NY is nowhere near. Thanks for sharing the Dan Dan Noodle recipe. Did you go to that place in Flushing, Queens? There’s a woman from Chengdu who has a Sichuan eatery in the downstairs of some shopping place on the main Chinese-business street. She has a lot of the stuff I ate all of the time when I lived in Chengdu. I got the liang fen, but not the thicker, shorter kind, and the sauce was the first thing I had that REALLY tasted like I was in Sichuan. Chengdu xiao chi is one of my favorite things in the world..like those egg rolls stuffed with shredded ma la potatos, tea eggs with la jiao and hua jiao. Crushed rice and beef, steamed. 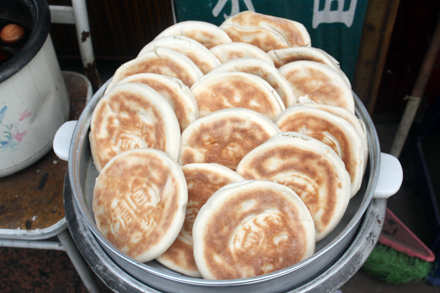 Jinli Street. Okay, I’m torturing myself now. I have been following your blog for a couple of years now and I never post. I am located near San Francisco and I always thoroughly enjoy your posts and trying out your recipes. Thank you for the quality content that you always post, especially all of the photos. I can’t wait to try these noodles, time to head to my local Chinese Market! Hi Michael, Thank you for your wonderful comment. I am heartened by your words and will continue to share my love of cooking. Love street food vendors although sometimes your belly don’t agree with you…everytime I visit Asia I always eat way more street food than restaurants foods! Great post! Thanks for the the recipe! 🙂 I’ll make myself a bowl of noodles soon! Thanks for the wonderful recipe! I just finished eating the noodles and I have to say they were amazing! I even made your chili oil recipe for this dish and I`m glad I did! Thanks again, and keep these awesome recipes coming. Thank you Frank for the wonderful comment. I’m so pleased to learn that you were successful in making the noodles from my recipe. Thank you John for your kind words about my recipes and the wisdom you quoted in your comment. Don’t we always find comfort in a well made meal?